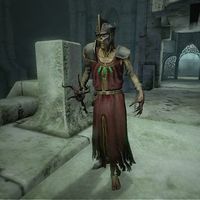 The King of Miscarcand is a lich that can be found in Miscarcand, Morimath. He will appear once you retrieve the Great Welkynd Stone. If you don't kill the King of Miscarcand during the related quest, he and his two Zombie Guardians will pursue you anywhere in Cyrodiil, making you unable to sleep, wait or fast travel, because the game always states there are enemies nearby. See the quest page for details, including fixes. This page was last modified on 19 December 2013, at 23:11.